Happy Memorial Day! Thank you to all who have served. 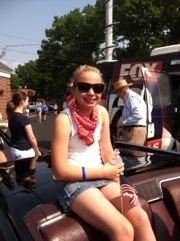 We always start our Memorial Day Celebration with the local parade. 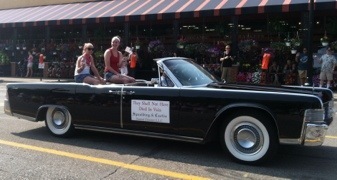 This year my daughter had the opportunity to ride in a 1965 Lincoln in the parade with her friend – aren’t they cute? Since it is 91 hot and humid degrees here in Michigan we decided to relax indoors instead of tackling the many outdoor projects we had hoped to accomplish this weekend. I was on the phone with my Dad – a Korean War veteran – thanking him for his service when I heard pans rattling in the kitchen. My husband is a great cook and so I assumed it was him. When I finished my call I found my 11 year old daughter alone in the kitchen measuring peanut butter. 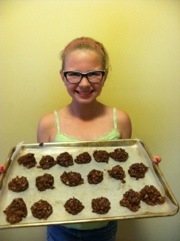 It seems she had decided to DIY and make some no-bake cookies! She had gone on the internet a searched for a recipe and found this one: No Bake Cookies I. She had all the ingredients in the pan and seemed to be doing a great job. As I was looking at the pan I saw some tiny marshmallows in the pan, hmmm? I asked her if the recipe called for cocoa and of course she said yes and then showed me the box of hot cocoa mix with mini marshmallows. I explained the difference between cocoa and cocoa mix and we decided just to add the cocoa because as she said, you can never have too much chocolate. I resisted the urge to jump in and take over, which is a bad parenting habit of mine. I did assist by reminding her to set the timer and having her re-read the directions before she turned on the stove. She managed to pull it off basically on her own – so now she is an official DIYer just like her Mom! By the way they are delicious – and there really is no such thing as too much chocolate! Is this the Royal Oak parade? I am so jealous!